With the space crunch and growing apartments in the city, a small kitchen appears to be inevitable. Not every home gets a chance to make space for a large kitchen. A small kitchen needs to fit in a lot of things. It is, in fact, a challenge to fit in all the items there. 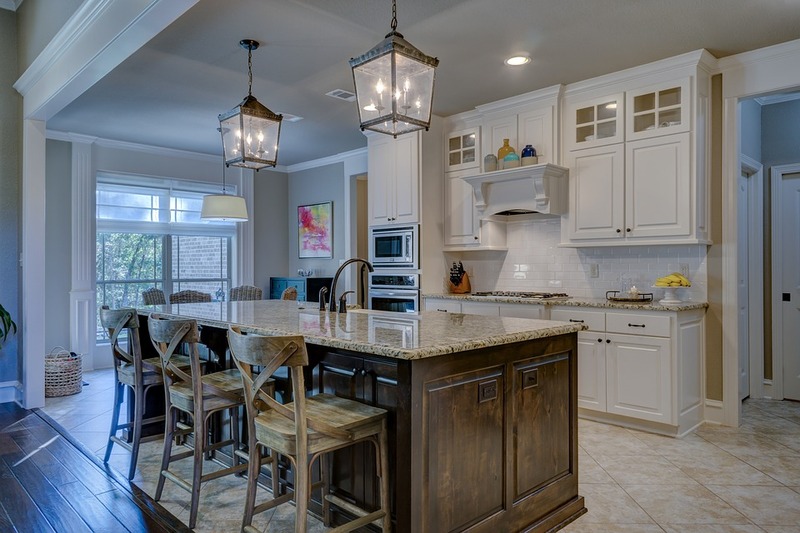 But looking from another angle, it is also an opportunity to keep the kitchen small, cozy, and warm. All that one needs to do is to make use of all the space and the best possible way is, of course, to utilize the whole of it with kitchen cabinet accessories. Understanding the needs: Before one even starts to design the kitchen, the most important part is to figure out the needs of the user. If it is a household, then there will be a lesser amount of commodities to fit in, if it is a restaurant there will be more. Therefore understanding the necessity is the first step to address it. Kitchen cabinetry: Kitchen cabinet accessories are kept mostly in the cabinet, so customizing the cabinetry may help in a lot of ways. Pull out drawers: Pull out drawers help in organizing a lot of things. When there are deep pullouts one may divide the drawers through shelves and keep the accessories inside. Pull out drawers also help in organizing wastes contributing to recycling. Accessories: These are the things that fill up the kitchen. To fit them all in the best way, try to keep things in minimal numbers. Eliminate the unnecessary kitchen cabinet accessories and keep the ones that are really needed. Multi-functional islands/ rollaway: This is an effective way of keeping the kitchen cabinet accessories intact and at the same time move to and fro when needed. Having a multi-functional rollaway island will help to move it whenever one needs space. Magnet strips: Magnet strips may not be applicable to all the kitchen cabinet accessories but one can always use them for attaching knives and choppers. Things like choppers and knives are continuously needed, and it is better to keep them in easily accessible areas. On can fix these magnetic strips on the walls near the chimney. 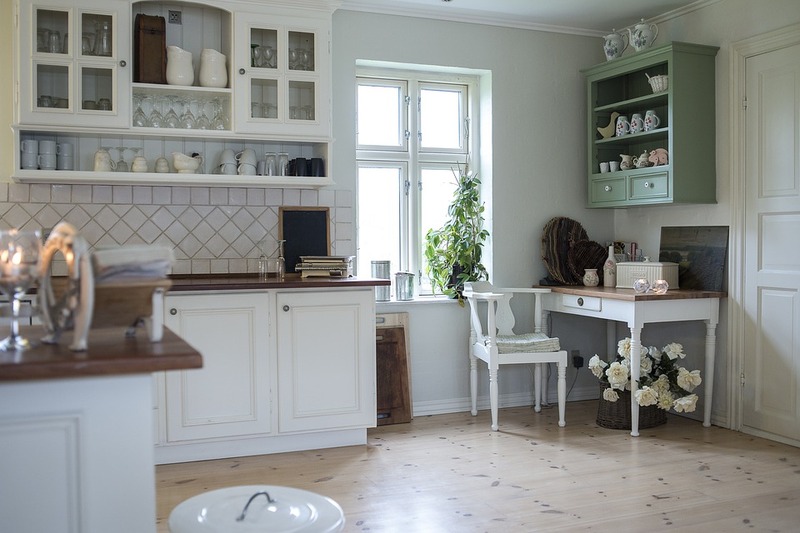 Cutting down the size of the furniture: There is another easy way to make space in the kitchen by reducing the size of the chairs, tables, and other furniture. One can also keep the dining table and chairs outside the kitchen. Dividing the drawer: Once the customization of drawers is done, they can be further made useful by diving the drawers. Little utensils and kitchen cabinet accessories can be put inside these drawers without letting them pile on each other. This diving part can be done according to the needs and is thus extremely helpful in keeping both small and large things cluttered up. Using the corner cabinets: More often we let the corners of the cabinets free without using them. But these spaces can actually be well utilized for keeping cutlery and little jars. However, planning corner shelving can help you with maximum storage. One can also store excess dry food items or not so important stuff at the base level. Shelving the entrance: Shelving the entrance is something we generally don’t do. But once we put up shelves around the entrance door they can be used in keeping various items without giving a clumsy look. Cube shelves around the entrance also glam up the kitchen when the fascinating dinner & tea sets are kept there. This makes the entrance eye-catching at the same time functional. 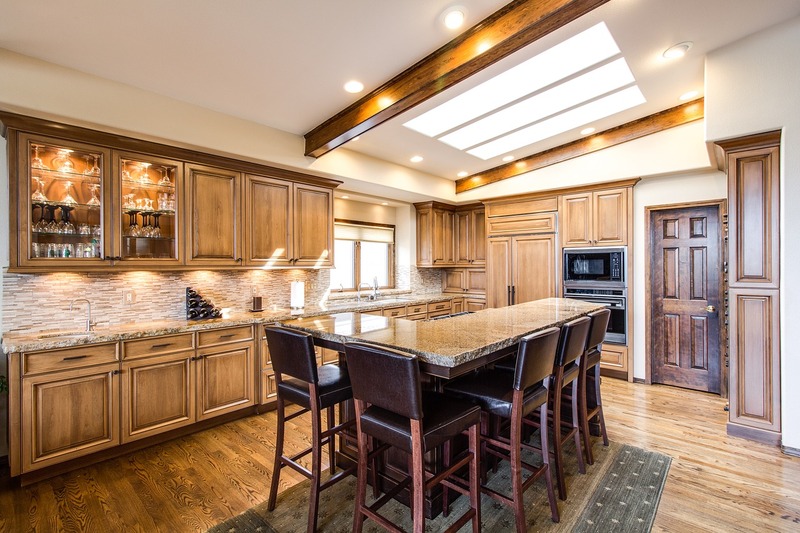 Using overhead space: Spaces above the fridge, extending the cabinets to the ceiling, putting up hangers on the top are ways in which you can utilize the upper part of the kitchen. Bottles, sauces, bowls etc. can be kept on the shelves over the top of the fridge. Pots and pans may be well hanged from the top beautifully and a lot of things that are not used regularly may be kept in the upper part. This way the things we use daily will be easily accessible near our hands in their most organized form. Shelves under the dining table: Keeping a shelf or shelves under the dinner table will enable to place the dinning sets if not anything else. This will not only save space but will also be functional while dining. The plates and small bowls will fit in absolutely well giving any edgy, yet beautiful look to the table. Shelving: Even when the cabinet is not customized one can always design the shelves accordingly. Open shelves on the walls will make the kitchen look airy and create extra space too. Hanging rods are also helpful in keeping mugs and cups of daily usage apart from pans. One may also bring in extra movable shelves for fitting in the kitchen cabinet accessories. Using dead ends: Last but never the least the dead end of a kitchen or the spaces nearest to the kitchen may be used as storage spaces. There are times when keeping extra dinner sets and food storage help you to handle the sudden appearance of guests in a greater number. As these items are not needed on a regular basis, using the dead ends as storage spaces is an excellent idea to keep such things. However, tiny kitchens even can always be well organized if we plan the entire design up with minute observations and utilize each and every scope and space in a logical and clever way. When such small kitchen is well organized, it will give your household a beautiful look without any risk of clumsiness. Along with being a rising interior designer, Kelly takes great interest in writing. 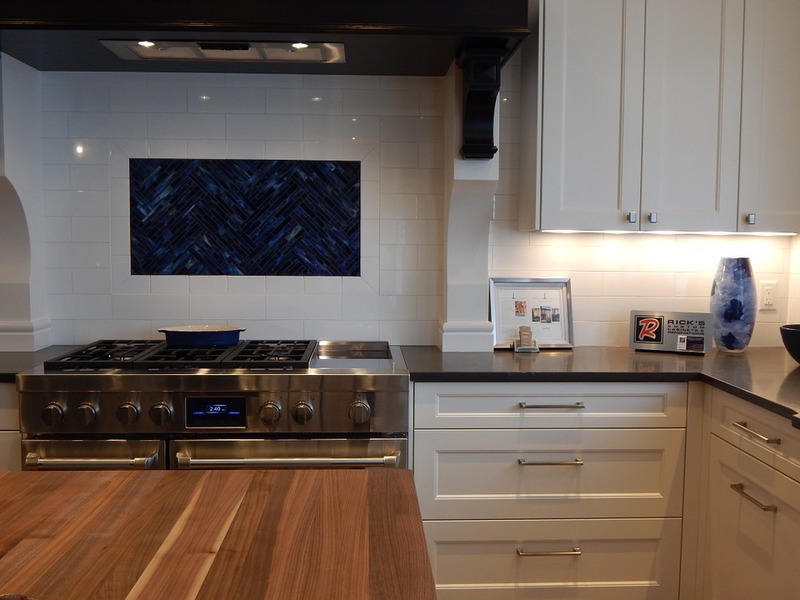 She loves to share her experience in designing cabinet accessories in this blog. I really enjoy reading your blogs. Beautiful presentation of creative ideas. Loved your idea of planning corner cabinets and shelving the entrance area. I feel happy that you relish my blogs. Thank you!! How to Choose the Best Kitchen Accessories?